Washington, DC may still not have the reputation of the top echelon of American sports cities, but that doesn’t mean it’s a boring town for fans. Our Capitals sit on top of the NHL after winning the Stanley Cup this summer. DC United is playing in a new stadium with one of England’s biggest stars on its side. The Mystics reached the WNBA finals. Even if you ignore the Redskins and the Nationals, hardly a day goes by without a game to show. And with all the competition for games from college alumni groups or DC-area transplants, finding a sports bar that aligns with your preferences is key. Some favor a specific city or sport, some have tons of space for groups, and others focus on food and a more casual vibe. Here are the best sports bars in and around DC. Despite its name, this subterranean hangout has nothing to do with religion. Instead, it worships all things beer, board games, and sports. The cavernous spot is somewhat hidden in Georgetown, which can be good given the amount of tourists that clog the surrounding streets. Groups shouldn’t have trouble finding territory at one of long communal tables or pods of leather couches. 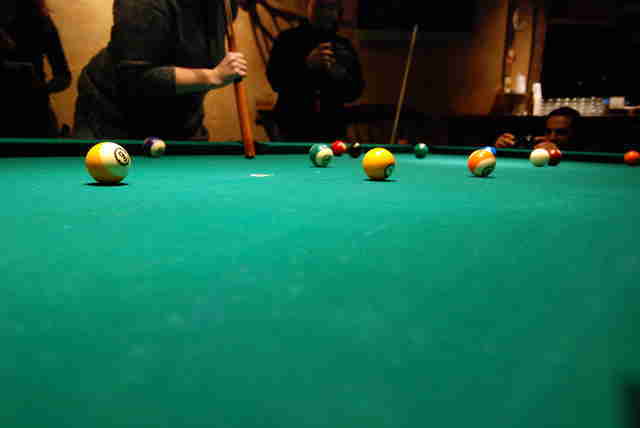 Buffalo Billiards is not an interesting or unique sports bar, and it doesn’t have to be. It’s got lots of TVs, games like pool and Skee-Ball, and multiple bars. Sometimes that’s all you need to pass a few hours cheering on the home team. College and professional fan bases host regular watch parties here, and there are rotating food and drink specials seven days a week. Some may say that Boston sports fans, raucous as they can be, are best confined to cheer from their own dedicated location. 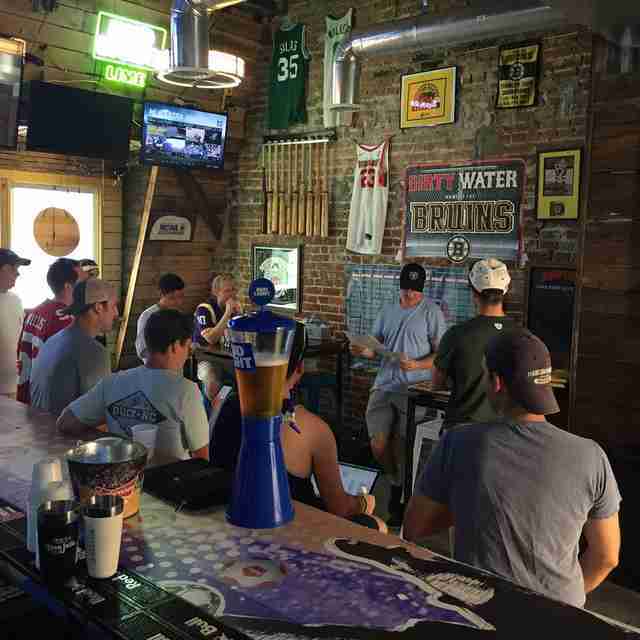 Enter Dirty Water Sports Bar. It’s decked out with memorabilia of the Patriots, Red Sox, Celtics, and Bruins as a beacon to all the displaced New Englanders in the District. All that’s left to do is grab a Sam Adams and crank The Dropkick Murphys. New York sports fans -- you’ve been warned. Expats and Washingtonians alike gather to watch soccer matches at this friendly dive pub. Saturday mornings are prime time to grab a pint and an English breakfast plate alongside English Premier League action. Any major international contest is liable to draw sizable crowds, so expect to come early for any big-ticket events. American leagues get their due here too, especially DC United and MLS, college football, and the NFL. Cheap food and booze are two of the big selling points at this Detroit- and Chicago-themed haunt. A basic beer at this (cash-only) dive runs just a few bucks no matter what time you stop in, and it’s only $2 during the 4-7pm weekday happy hour. A couple dollars more buys a whiskey and beer combo, and the affordable rail drinks use quality booze like Cotton and Reed rum and Tito’s vodka. Ivy and Coney’s food sticks to its regional roots with a menu of Midwestern-inspired dogs and sausages. Elbow room can be tight, so don’t count on getting seats for big groups. 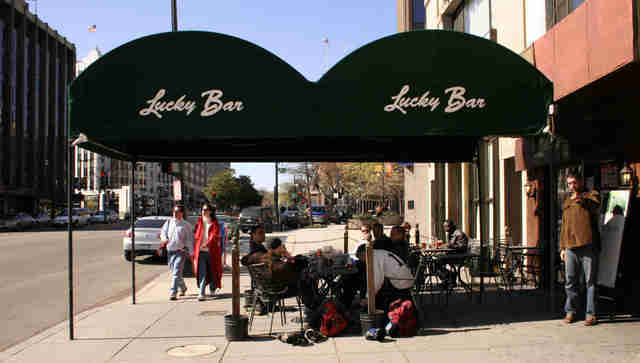 Mackey’s spent 18 years on L Street and became a go-to for the after work happy hour and sports bar crowd. It moved to its larger, two-story space Metro Center in 2017 and continues to be a favorite location for beer, comfort pub fare, and sports. Mackey’s is a good low-key bet for keeping up with any of the local DC teams or for organizing a private watch event. Nellie’s is a gay bar that takes its sports and good times equally seriously, no matter who is involved. It’s become part of the fabric of the bustling U Street and Shaw corridor since opening in 2007, with two floors including a rooftop for enjoying buckets of cold beer or signature colorful cocktails. When games aren’t on, stop in for drag brunch on Saturdays and Sundays or drag bingo on Tuesday nights. Game night here goes beyond what’s on TV thanks to a sizable arcade that includes pinball, foosball, and video game classics like Mortal Kombat and NBA Jam. It’s the perfect distraction for anyone who’s either not a die-hard fan or just sick of watching sports. Action is shown on one of the bar's nine 10-foot screens or the 22-foot movie screen. There are more than 30 draft beers to pick from and a small menu of snacks like wings, nachos, and pretzels with queso. There is no lack of screens here. Public Bar has nearly 50 TVs spread across three floors, including a giant HD projector screen. Booths on the main floor have individually controlled setups for custom game watching while chowing down on classic bar nosh like nachos or Buffalo wings. 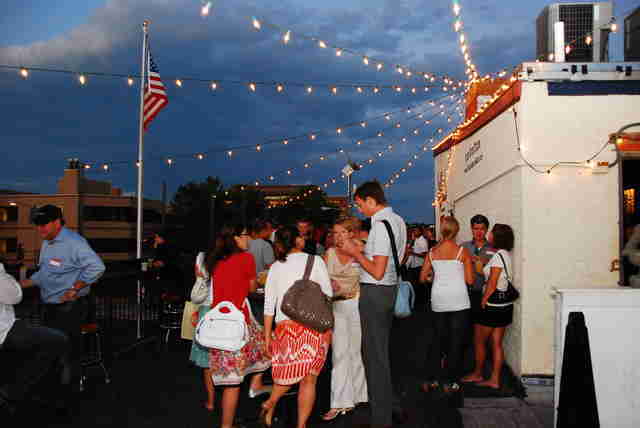 An open-air rooftop is a nice place to catch a glimpse of the action during nice weather days. In the early days of the Navy Yard neighborhood, Justin’s Cafe was one of the first spots to grab a beer and watch a game. 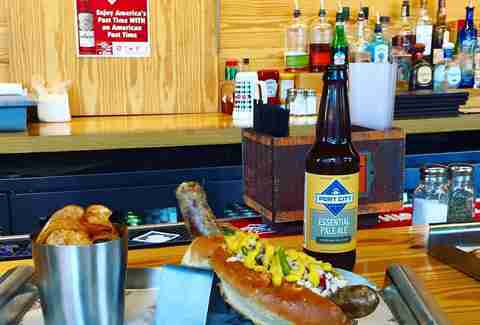 In 2014, owner Justin Ross opened The Big Stick, a sausage- and beer-slinging sports bar outfitted with a rustic decor and lots of wood accents. Its proximity to Nationals Park makes baseball the sport of choice here when it’s in season. It’s likely not the literal “Greatest of All Time” sports bar, but Arlington residents will do well sprawling out at this sleek bar and restaurant inspired by the world’s premier athletes. There are more than 50 TVs along with three 12-foot “TV walls” and a handful of arcade games to help pass the time. The G.O.A.T. places an emphasis on its food menu too, serving up creative dishes such as a duck quesadilla, wagyu beef meatball sliders, and fried oysters. It may just be enough to convince those DC friends to venture across the Potomac. 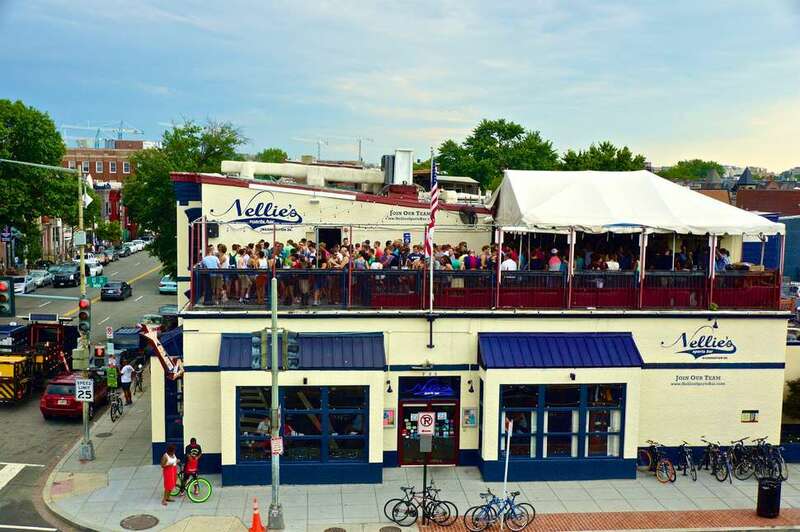 Followers of Florida State University and the Chicago Bears fill this no-frills Capitol Hill spot on weekends for all-day specials on beers, shots, and rail drinks. Brunch and bottomless cocktails are served from 11am to 3pm on Saturdays and Sunday as well, for those who prefer to get an early start on game-day drinks. Philadelphia fans flock to Ventnor’s on the city’s game days, taking advantage of the bar’s two levels and many TVs. The bar plays DC sports regularly too, as well as other important matchups from across all leagues. Ventnor may not be one of the largest spots to watch sports, though what it lacks in space it makes up for with its respectable craft beer list and pub food.